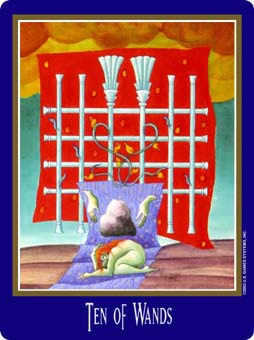 You are beginning to realize that what you have been pursuing is actually internal. 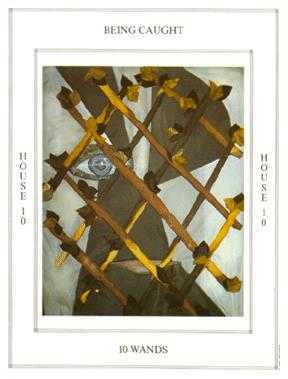 The Ten of this suit represents an all-out effort, an obsessive commitment to a task which demands everything you've got. 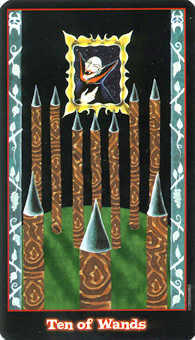 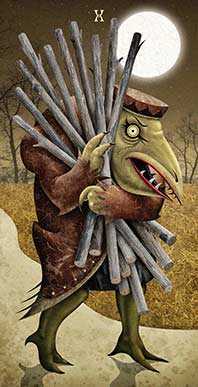 The person shown in decks with pictures is in no position to rest until he makes it inside the stout walls of the well-defended castle in the distance. 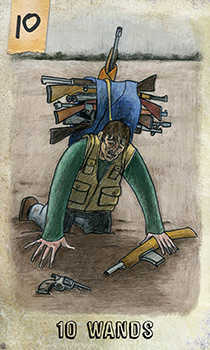 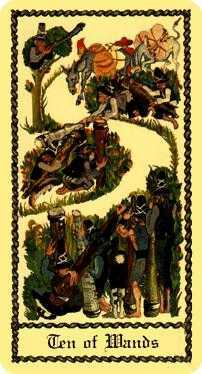 If he fails, he will become prey for the highway robbers after dark. 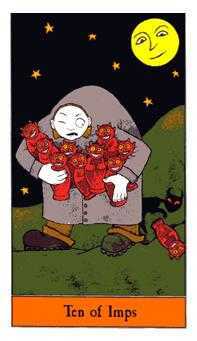 It doesn't matter that he's overloaded and underfed. 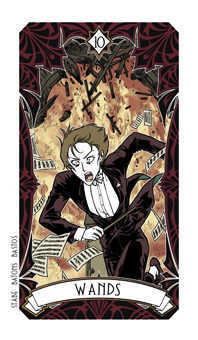 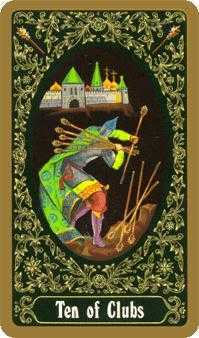 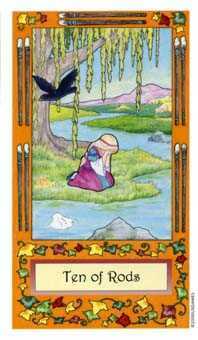 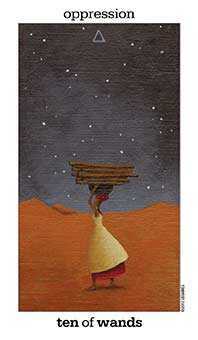 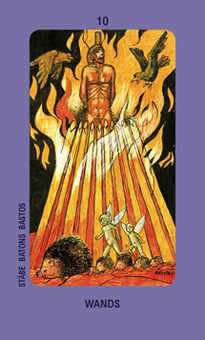 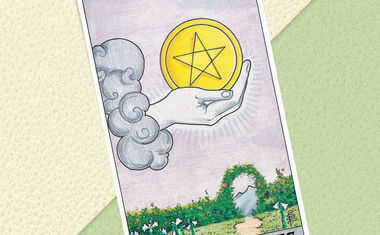 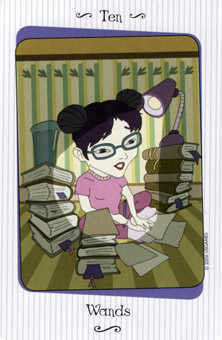 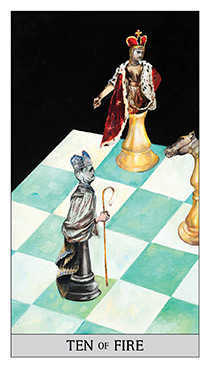 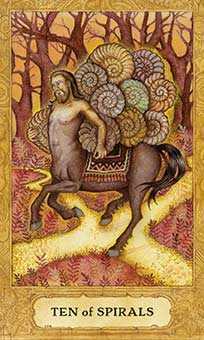 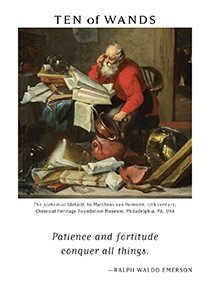 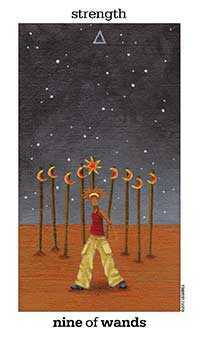 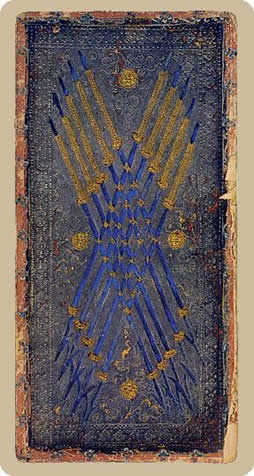 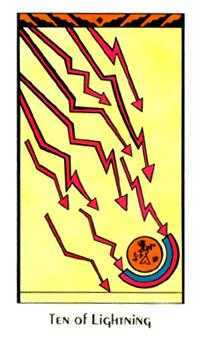 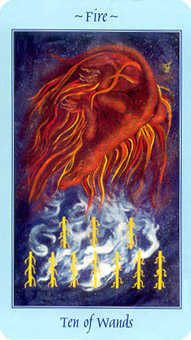 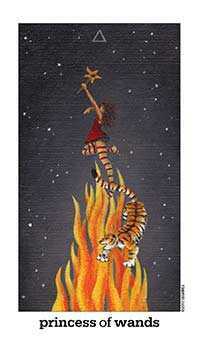 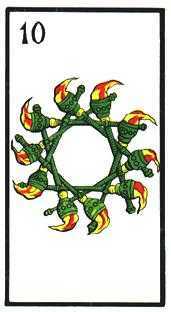 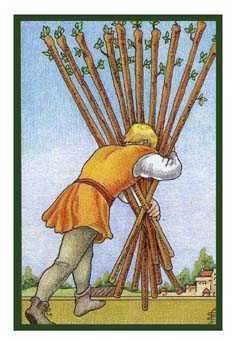 With this card, you have to do whatever it takes to get to completion -- nothing can be allowed to interfere. 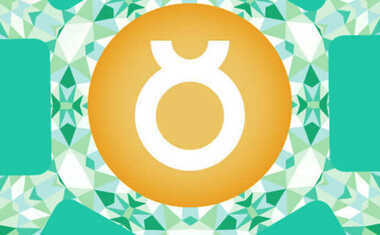 Rediscover the idealism and optimism of your youth to reinvigorate your vision. 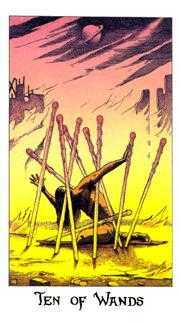 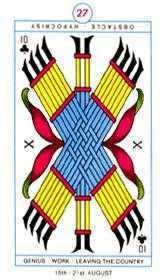 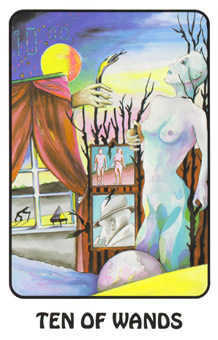 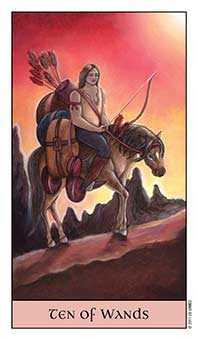 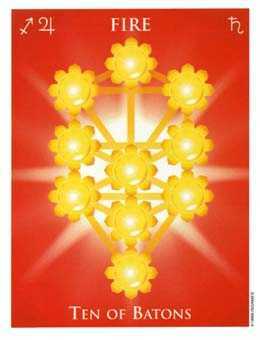 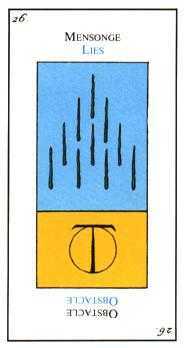 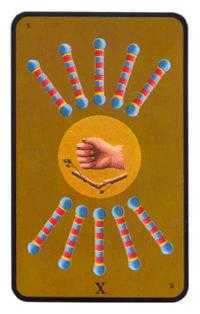 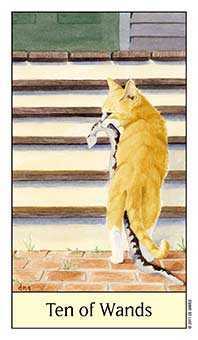 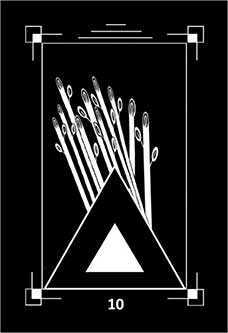 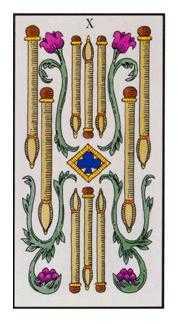 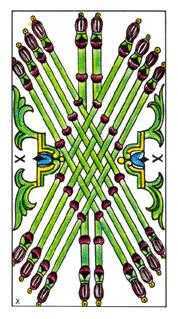 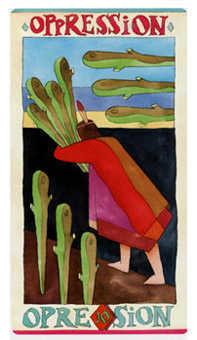 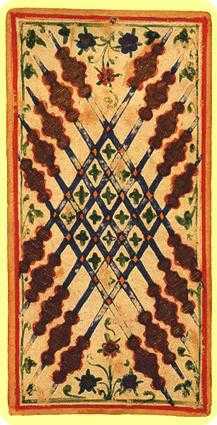 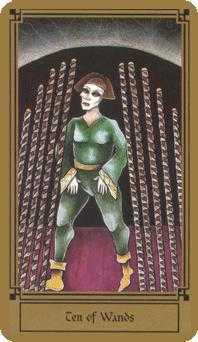 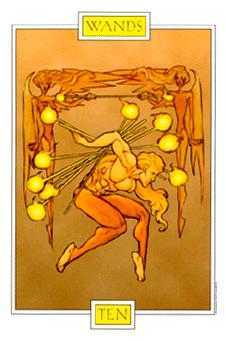 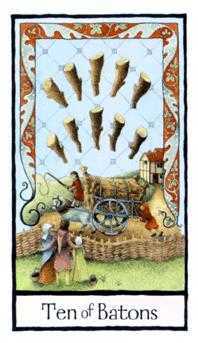 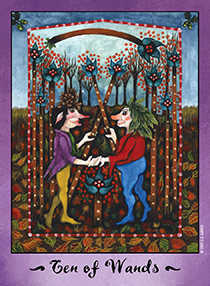 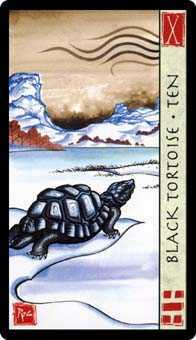 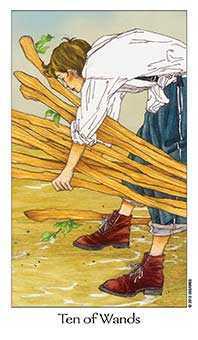 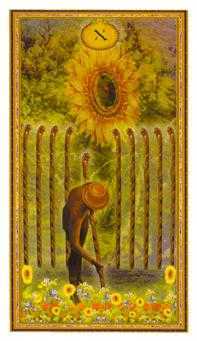 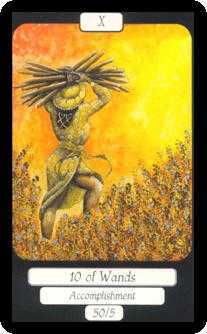 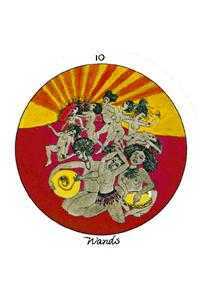 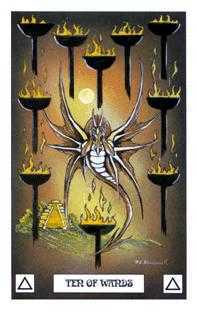 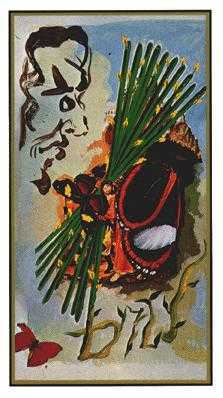 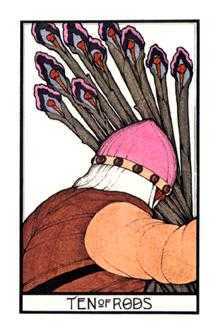 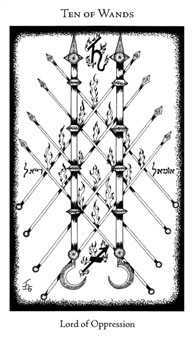 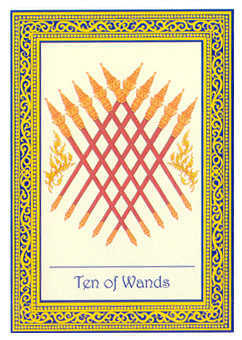 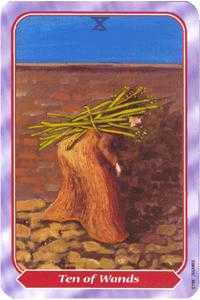 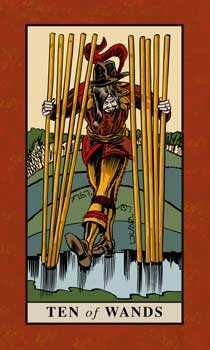 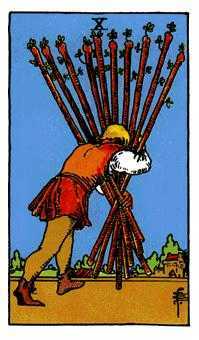 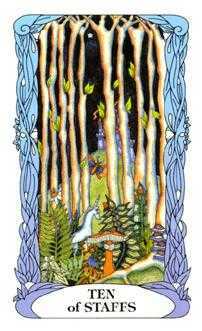 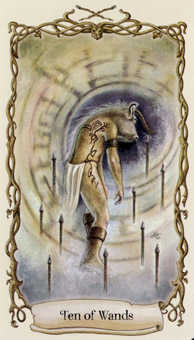 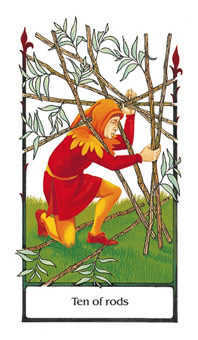 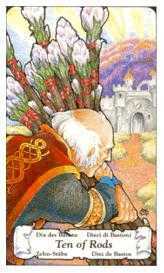 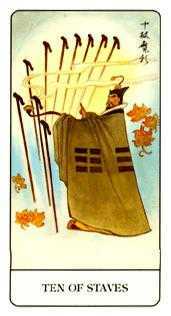 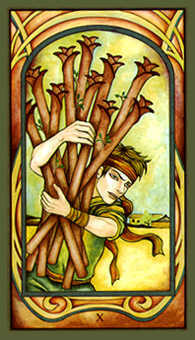 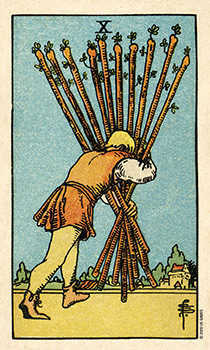 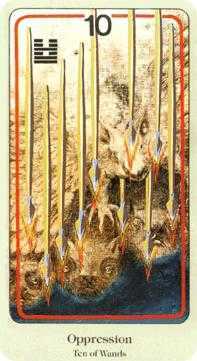 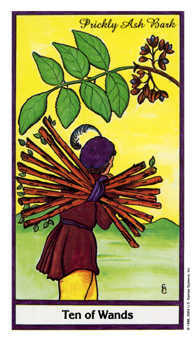 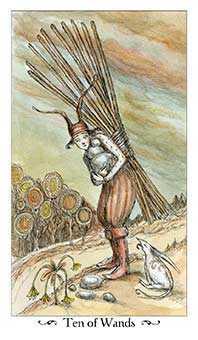 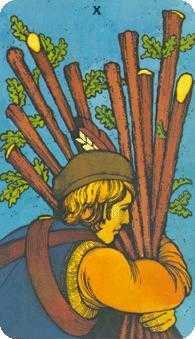 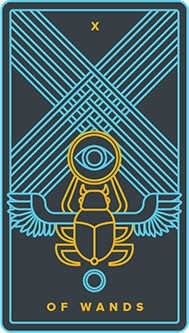 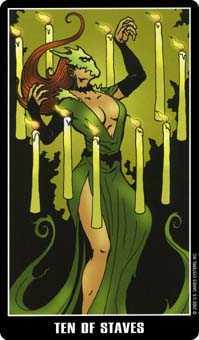 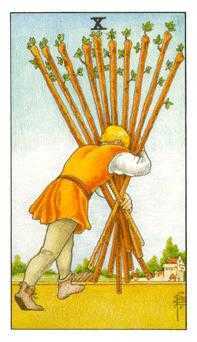 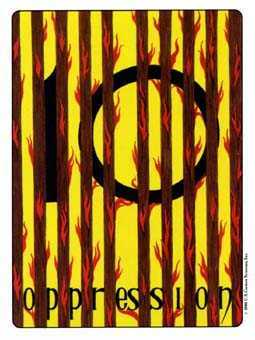 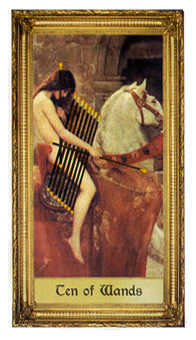 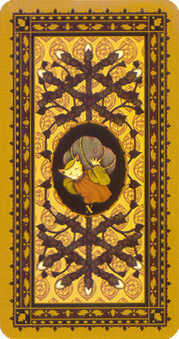 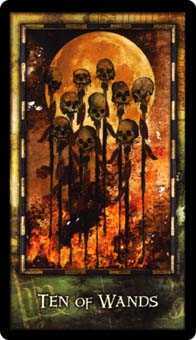 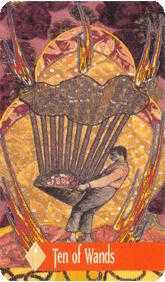 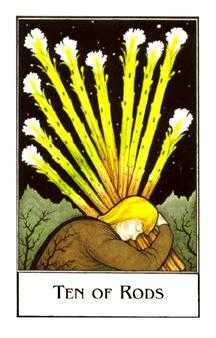 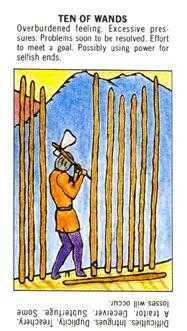 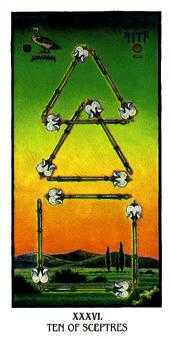 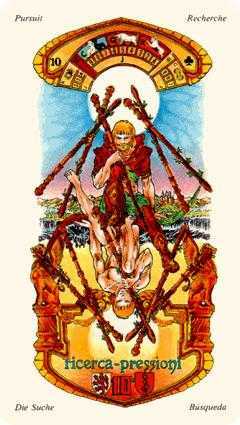 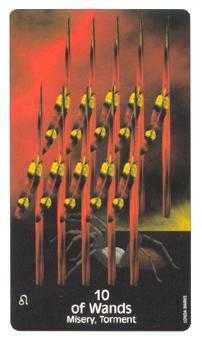 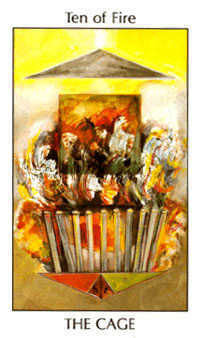 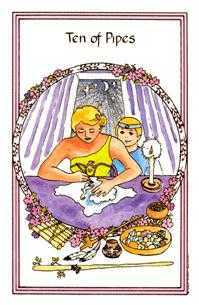 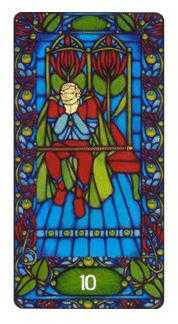 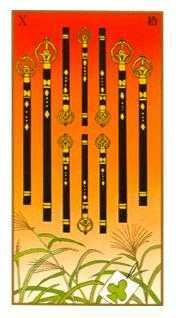 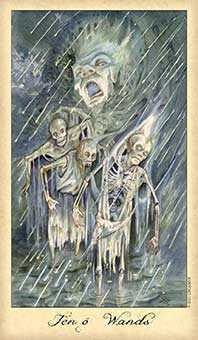 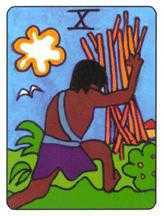 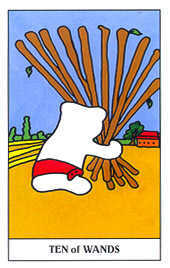 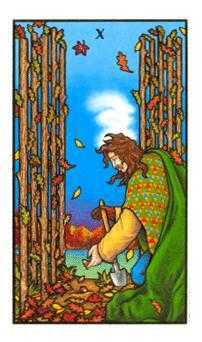 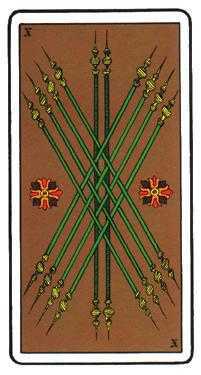 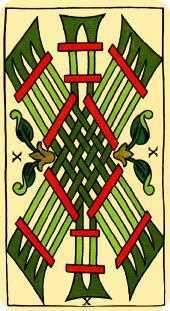 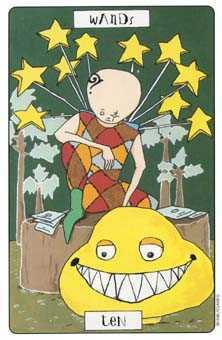 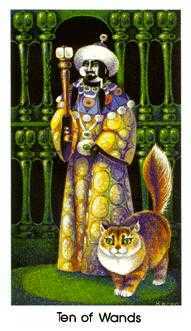 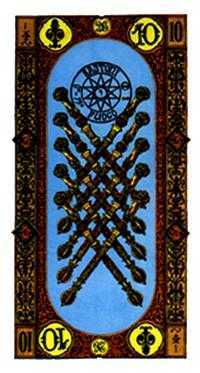 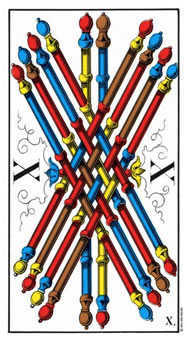 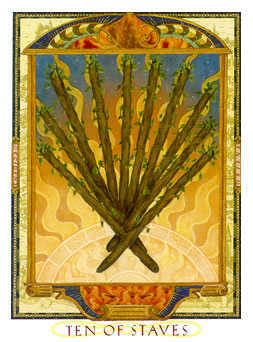 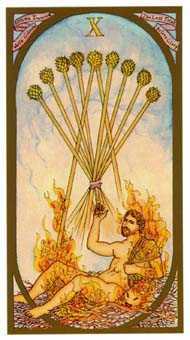 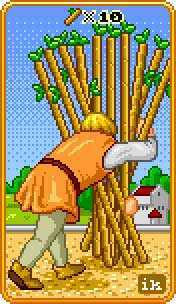 The Ten of Wands in this position advises you to remember the true, simple heart of your youth and all the idealism it held. 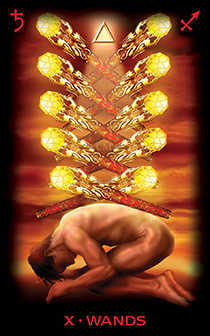 Now may be the time to reach deep into yourself and identify your purest, most wholesome impulses. 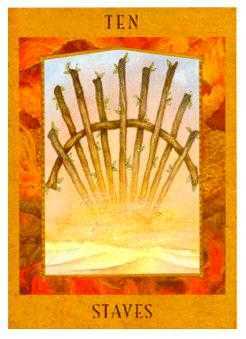 As you do this, allow your optimistic and honorable side to see what's good about the world. 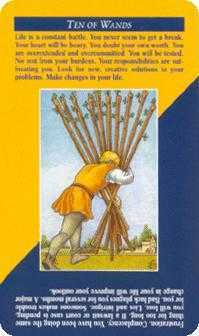 Look beyond the challenges, setbacks, disappointments and frustrations you tend to see so easily. 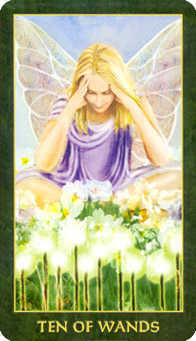 As you reawaken your high minded inner child, you will refresh your daily life with a joyful purpose.